Genre: Real life stuff about families and old age and love and loyalty. Sometimes kids see the world so much better than adults. They see what the real deal is. They call life as it is, they have an innate sense of situation and place. If someone is cruel- they say so, if someone is lonely- they know, if someone is manipulative they figure it out! Us adults we cover our faces, our bases and our hearts. 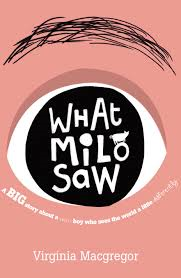 This book is about Milo- a kid who has an eye sight disorder that makes him see the world through a pin hole and he sees it very clearly- it is just no-one believes him- except the Syrian illegal immigrant! It is about Milo's Gran who has dementia and is shuffled off to an old folks home against Milo's deepest wish- he loves his Grandmother- he is her protector, she is his believer- they go together!! Milos starts to see the cracks in the old folks home, the cruelity and the deceit, so he hatches a cunning plan to expose them. Chuck in the character of Milos pet pig- Hamlet and his confused and lost mother who tries to do her best- we have a cracking yarn about love, life, and the way we all see- or dont see the world! Loved it!! How do you approach a book review that deals with youth suicide but also makes you somehow feel good. How can you write about a book that sends an empty shiver down your spine while still making you feel whole. How can I recommend a book that gives a kind of permission to end your life? Finch is a guy who just does not fit, he does not fit at school, he does not fit at home. he discovers though that he does fit with Violet- she is cool and popular, he is not, he is a freak- or so he is always told. He and Violet have a knowing- they are both suicidal, in fact they met each other while they were on a high tower ready to jump.. Despite Finch's weirdness and his reputation at school as being a freakish nobody- Violet falls in love with him- she discovers the real Finch. The question is- will it be enough to save Finch from himself! 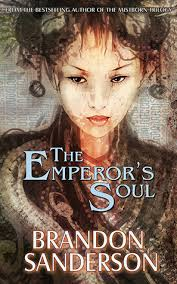 This book also deals with the power of a dysfunctional family and a father who has a violent grasp on his children, it describes the scars on the inside that this inevitably leaves. It journeys you through the pain of a siblings death through a car accident and all the survivor guilt it causes, it takes you to the heart of high school bullying based on fear and rank, you discover what a fake world that is. 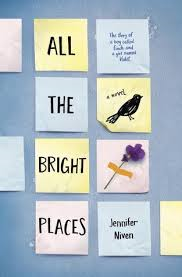 All the Bright Places is a gutting look at youth depression, its causes, its outcomes. I know Finch, I know Violet- they walk in this school too! Maybe that is why I recommend this book! Hi all- after a long summer break this blog is humming again for the New Zealand School year. I have had a chance to read much over summer, the covers below were my fav's. 2015 promises to be another awesome year, we have a new library system to play with and heaps of great new books already ordered for our indulgence. My first review tomorrow will be Gabi- Girl in Pieces! 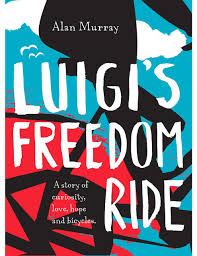 So here is too 2015, a year where we read much- not to kill time or revert into self, but we read to challenge our world view, we read to enable to feel with those that love, with those that hurt, with people who suffer injustice and live in worlds of demeaning powerlessness. We read to empathise with others who journey different paths to our own, making us more compassionate, more engaged . more riled! In all these things we read to be more human. I am no fan of quoting researchers- they can say whatever they want to say, but one has said that the more we read, the greater our empathy to the extended worlds around us becomes- to me that is the power of reading- knowledge gaining is important, learning about the functions of our worlds does matter- but all that is powerless without empathy towards those that inhabit those worlds. Read people- it will make you nicer!! !